Ozone is the unstable, highly reactive triatomic form of Oxygen. Oxygen is O2 while Ozone is O3. In order for Oxygen to form into Ozone, Oxygen molecules must be “pulled apart” and reformed. This takes energy in the form of electrical excitation of Oxygen which pulls apart Oxygen molecules. This is usually accomplished with High Voltage (Corona Discharge) Ozone Generators. Once pulled apart, most revert back to the stable form of Oxygen. However, some of the Oxygen is converted into Ozone in this process. Ozone is a colorless gas with a typical antiseptic smell. Ozone must be treated with respect as it is a very powerful oxidizing agent. Once formed, Ozone is an oxidizer that will react with organics or, over time, naturally decay back to the more stable form of Oxygen. However, once Ozone is formed, it can be put to work as a very aggressive oxidizer and sanitizer. 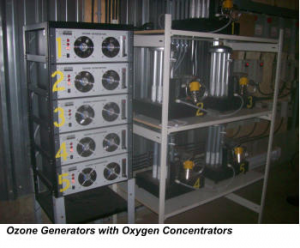 Producing Ozone is relatively easy with the advent of reliable, cost-effective Ozone Generators. Ozone cannot be stored, it must be used on-site when and where it is produced. Ozone Generators produce Ozone out of Oxygen (either air or concentrated Oxygen) and, as such, there are no on-going costs for chemicals or other inputs into Ozone Generators other than electricity. Ozone is produced with “Ozone Generators” which provide the electrical stimulation of Oxygen required to convert Oxygen into unstable Ozone. This is typically done with “Corona Discharge” Ozone Generators. Corona discharge refers to the high-voltage electrical field used in Ozone Generators. Air or concentrated Oxygen is passed through this electrical field and a percentage of the Oxygen is converted into Ozone, which can then be put to work. As well, UV or ultraviolet Ozone Generators can be used for the same purpose. However, UV Ozone Generators are usually not used in demanding Ozone applications because they tend to produce less Ozone over time and at relatively low concentrations. Ozone systems can be configured using multiple Ozone Generator combined into a larger system for redundancy or by using large Ozone Generators as a single-source system. Ozone Generators are often combined with Oxygen Concentrators to supply concentrated Oxygen (up to 95%) to produce a much higher concentration of Ozone. Ozone concentration in the gas stream is important for applications such as water treatment where a higher concentration of Ozone will dissolve more Ozone into the water stream. Ozone Generators can also operate with a dry air feed which is a simpler system. The tradeoff is concentration. Ozone produced on dry air will not have as high a concentration of Ozone in the gas stream as Ozone produced with Oxygen feed gas. Ozone Generators are used to “manufacture” Ozone out of one of the most readily-available substances on earth – Oxygen in the air. In fact, Ozone has been called “Enhanced Oxygen” for the simple reason that Oxygen (O2) can be converted to Ozone (O3). Ozone is produced naturally in the upper atmosphere (the Ozone layer) through ultraviolet radiation. As well, lightning will produce Ozone through electrical excitation of Oxygen molecules. Ozone Generators use both forms of producing Ozone. Some generators will use electrical fields (corona discharge) to produce Ozone. Others use ultraviolet lights (UV method) to produce Ozone. The end result is Ozone. There is no inherent advantage or disadvantage in either method, although Corona Discharge generators are generally regarded as more cost-efficient. Since Ozone cannot be stored, it must be used as quickly as it is produced. Ozone Generators are used to produce Ozone at the location where it will be used. Ozone Generators come in all sizes, ranging from small DC units used to clean air in your car to large industrial systems used to purify Millions of Gallons per Day of water in municipal water treatment systems. Since they require no chemical inputs, they are very cost-effective in long-term applications. Ozone is classified as an “oxidant” or a substance that converts organic material into their base compounds. Other examples of oxidants are chlorine and fluorine. Ozone can be put to use to convert air borne pollutants such as ammonia, mercaptans, sulfides and other organic chemicals into inert, non-odorous by-products. As well, it is a very effective disinfecting agent and will kill germs, viruses, bacteria, molds and yeasts. Ozone is an extremely fast-acting oxidant. It is these unique characteristics that allow Ozone to be put to use in agricultural operations such as swine or poultry barns. After oxidizing substances, Ozone then simply reverts to Oxygen. The target substances are broken down into their base components. There is no magic in the application of Ozone. It is a chemical process that is predictable and well understood by Chemical Engineers, chemists and, increasingly, doctors around the world. The cycle of oxygen and ozone is just like the cycle of water in nature. Ozone is also created by waterfalls, the oceans’ surf and during thunder and lighting storms with concentration levels triple the allowable limit, as set by EPA. Ozone created electronically or through ultra-violet light converts molecules of Oxygen (02) into molecules of Ozone (03). This is sometimes referred to as activated oxygen, triatomic form of oxygen or pure air. Being an unstable gas, ozone’s life span ranges from 20 to 80 or 90 minutes, depending mainly on the temperature. After completing its job, it reverts back to oxygen. This means ozone has to be produced on site. Ozone is second only to fluorine as the most powerful oxidant in the world. It’s the most powerful, natural air and water sanitizer readily available. Ozone will break down chemicals into their basic naturally-occurring component parts. After time they are eventually broken down into water, carbon dioxide, sulfur, nitrogen and oxygen.